The regional centre is the metropolitan area that includes Tōkyō, Yokohama, Kawasaki, and Chiba. The region is dominated by the Kantō Plain, the largest plain in Japan, crisscrossed by numerous rivers, including the Tamagawa, the Arakawa, and the Tonegawa. The plain is bordered on its northern and western sides by the Mikuni and Kantō mountains, in which several volcanoes belonging to the Fuji and Nasu volcanic zones are scattered. The Abukuma Mountains (阿武隈山地) extend from the Tōhoku Region to the northeastern part of the Kantō Plain near the Pacific Ocean. The plain also includes numerous lowland and upland areas. The Bōsō and Miura peninsulas are almost entirely hilly. The Izu and Ogasawara islands in the Pacific to the south of Tōkyō are also included in the Kantō Plain. In ancient times, the region was considered a frontier, and it was not until the establishment of the Kamakura shogunate in 1192 that the region began to be developed. The designation of Edo (modern-day Tōkyō) as the seat of the Tokugawa shogunate (1603-1868) led to its further development. Edo was renamed Tōkyō after the Meiji Restoration of 1868. 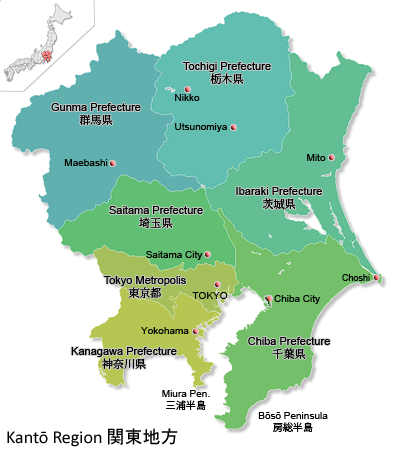 The term Kantō (literally, “east of the barrier”) originally referred to the area east of the barrier station (関所 sekisho) at Ōsaka in the present-day city of Ōtsu, Shiga Prefecture (not to be confused with the city of Ōsaka). The term was used in contradistinction to the Kansai Region west of the station. The border between the two areas was set during the Kamakura Period (1185-1333) at the three barrier stations at Suzuka (modern-day Mie Prefecture), Fuwa (present-day Gifu Prefecture), and Arachi (Fukui Prefecture). The border was later set further east at the barrier station in Hakone (modern-day Kanagawa Prefecture). The Tōkyō-Yokohama district in the centre of the region is Japan’s leading commercial and industrial area. It forms the Keihin Industrial Zone (京浜工業地帯 Keihin kogo chitai) and is noted for the production of chemicals, chemical fibres, petrochemicals, machinery, and metals, as well as for its textile, food processing, electrical machinery, steel, and publishing industries. The Keiyō Coastal Industrial Region (京葉工業地域 Keiyō Kōgyō Chiiki) extends eastward from Tōkyō into Chiba Prefecture, where steel, petrochemical, and petroleum refining industries have been developed on a large scale. The Kashima Coastal Industrial Region (鹿島臨海工業地帯 Kashima Kōgyō Chiiki) in Ibaraki Prefecture has turned into an essential zone for heavy and chemical industries, and the village of Tōkai (東海村 Tōkai-mura) had become a center of Japan’s atomic power energy programme, making headlines in 1998, when two workers died in a nuclear accident. The first reactor of the Tōkai Nuclear Power Plant was dismantled in 2011; Unit 2 is currently out of operation. Also located in the Kantō Plain are traditional industries such as sericulture, textiles, flour milling and sake brewing. Agriculture plays a declining, but a still vital role in the region’s economy. Extensive truck farming is carried out in the Kantō Plain near Tōkyō, and vegetables, potatoes, beans, legumes, and fruit are cultivated in the upland parts of the plain. Low-lying arable land throughout the region is used for the production of rice. Coastal fishing in the Pacific Ocean and Tōkyō Bay has declined rapidly in recent years due to vastly increased catches by deep-sea fishing trawlers, increased pollution and the vast expansion of reclaimed land in Tōkyō Bay. Tōkyō has Japan’s main international airport, Narita (NRT) Airport, and another domestic, and now also an international airport, Tokyo Haneda (HND). From Tōkyō, any part of the country can be reached, but since a lot of places that visitors to Japan want to see are in the west, transport fees can be expensive. The Tokaido line runs from Tōkyō to Ōsaka, providing access to the Kansai Region, and other lines run to the north and the Japan Sea coast. If you are intending to go to Hokkaido or Kyushu, consider getting a flight. From other parts of Japan, finding trains and flights to Tōkyō is easy. Another route to consider is taking a ferry along the coast. In summer, this is a slightly different way of seeing the coast of Japan. If you do arrive by air, there are several train and bus services from Narita and from Haneda to either Tōkyō or Shinjuku stations, among other locations. From either of these two transportation hubs, you can get virtually anywhere in the city. The temperatures for Tōkyō are largely representative of the Kantō Region as a whole, but note that the higher you get (in altitude), the lower the temperature will be. If you head up into the mountains of Gunma or Saitama, temperatures will be lower. As with the rest of Japan, summers are relatively hot and humid (in degrees centigrade, in the thirties), and quite cold in the winter. It very rarely snows in Tōkyō, and even when it does it almost never settles. The period July-August is the hottest and combined with the typhoon season this is probably not the best time to see Japan – but if you are in the city there are plenty of air-conditioned buildings to retreat to (although in order to reduce CO2 emissions, a “Cool Biz” campaign has been introduced recently, limiting the air-conditioning of public and office buildings to 28 degrees centigrade), or you can head for the colder air of the mountains. As ever, remember the monsoon season if you intend to be outside a lot. However, in major cities such as Tōkyō, where you will be travelling mostly by underground train or bus, you will be less affected than the countryside. Kantō is usually worst hit by typhoons in the August-September period – slightly later than the southern part of the country – so consider this when planning your trip. Below find a brief list of some interesting places to see in Tōkyō and around. Tokyo Imperial Palace (皇居 Kōkyo): Imperial Palace East Garden, Kitanomaru Kōen (北の丸公園), Yasukuni Shrine (靖国神社 or 靖國神社 Yasukuni Jinja). Tsukiji Fish Market (築地市場 Tsukiji shijō): fish market, Tsukuji Honganji Temple(築地本願寺), Namiyoke Inari Shrine (波除稲荷神社 Namiyoke inari-jinja, Hamarikyu Gardens (浜離宮恩賜庭園 Hama-rikyū Onshi Teien). Note: while the outer market with its shops and restaurants is still in operation, the fish market moved to Toyosu in October 2018. Asakusa (浅草) Area: Sensō-ji (金龍山浅草寺 Kinryū-zan Sensō-ji), Kaminarimon (雷門), Kappabashi (合羽橋) or Kitchen Town famous for its plastic display food, Sumida River cruise, Tokyo Sky Tree, Japan’s tallest structure. Ikebukuro (池袋): Tokyo Met Art Space, Metropolitan Plaza, Tobu Dept Store, Seibu Dept Store, Sezon Museum of Art, Sunshine City (サンシャインシティ), Toyota Amlux. Kanda (神田): Akihabara Electric Town, Yushima Seidō (湯島聖堂), a Confucian temple from the Genroku Era (17th century), Transportation Museum, Jimbocho (神保町 Jinbōchō), a centre of used-book stores and publishing houses. Ginza (銀座): Mitsukoshi, Takashimaya, Wako, Matsuya department stores, Sony Building, Idemitsu Art Museum, Japan Sake Center, Nikon Salon, Contax Gallery, Art Museum Ginza, World Magazine Gallery, Kabuki-za Theatre (歌舞伎座), Hachikan Jinja, Hibiya Park (日比谷公園 Hibiya Kōen). Tokyo Station: Yaesu Underground Shopping Arcade, Tokyo Stock Exchange, Kite Museum, Yamatane Museum of Art, Bridgestone Museum of Art (ブリヂストン美術館 Burijisuton Bijitsukan), Tokyo International Forum Tokyo International Forum (東京国際フォーラム Tōkyō Kokusai Fōramu). To the south of Tōkyō is Kanagawa Prefecture and the Izu Peninsula. Kanagawa Prefecture contains the cities of Kawasaki and Yokohama, which effectively blend into the urban sprawl of Tōkyō. Yokohama is well worth a visit, even if just for its Chinatown and excellent shops and restaurants. Little further south again, on the coast, lie Enoshima and Kamakura. Kamakura was at one time the head of the Kamakura bakufu or shogunate from 1185 to 1333; there are enough sights to keep you occupied here and on Enoshima for a day trip from Tōkyō or for an overnight stay. Little further south is the Izu Peninsula, with perhaps the most famous onsen (hot spring) resorts in Japan. Hakone, Amagi Yugashima, Shimoda, Izu-Nagaoka, Ito and Shimokamo are all popular. If you have time, take a ferry from Tōkyō, Yokohama or Atami (熱海) for Ōshima and the islands of the Izu Islands. Yokohama: Minato Mirai, a massive urban development project comprising the Landmark Tower (横浜ランドマークタワ), Japan’s third-tallest structure, the Pacifico Yokohama convention center, the Intercontinental Hotel, the Cosmo Clock 21 Ferris wheel and a thriving business area; China Town, Sankei Garden (三溪園 Sankei-en), the Silk Museum, the Doll Museum, Museum of Art, Hakkeijima Sea Paradise (横浜・八景島シーパラダイス Yokohama Shīparadaisu). Kamakura (鎌倉): Engakuji Temple (円覚寺), Shōkozan Tōkei-ji Temple (松岡山東慶寺), Kinpōzan Jōchi-ji (金宝山浄智寺), Kenchō-ji (建長寺), Enno-ji (円応寺), Tsurugaoka Hachiman-gū Shrine (鶴岡八幡宮), National Treasure Museum, the “Great Buddha” (大仏 Daibutsu) at Kōtoku-in (高徳院), Hase-dera (長谷寺). Enoshima (江の島): water sports in summer, temples dedicated to Benzaiten (弁才天 or 弁財天), the Hindu goddess Saraswati, one of the seven Gods of Good Luck, and botanical garden. Mashiko (益子): a town in Tochigi Prefecture famous for its traditional pottery called mashikoyaki (益子焼). Nikko (日光市): Nikkō Tōshō-gū (日光東照宮), the mausoleum of Tokugawa Ieyasu; the Futarasan Shrine (二荒山神社 Futarasan-jinja), the Nikkō National Park (日光国立公園 Nikkō Kokuritsu Kōen, and its onsen (hot springs). Hakone (箱根) entrance to the Izu Peninsula, and a famous hot spring resort. Mount Fuji symbol of Japan, hiking around the mountain and five lakes. Hey There is a Pokemon Region of the same name and is based on it.